Sri Lanka Monday detained a senior aide to former strongman president Mahinda Rajapakse on allegations of fraud, the second official close to the ex-leader swept up in a blitz on corruption. 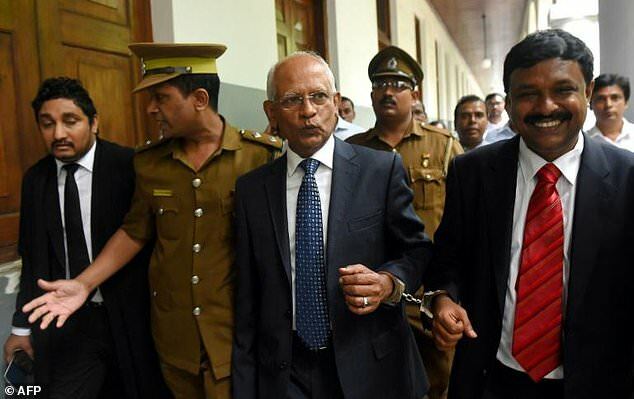 Gamini Senarath turned himself in to authorities on Monday and will face court over allegations of fraud involving the construction of the Hyatt Hotel in Colombo. Police told a court last month that Senarath was wanted in connection with the disappearance of $27 million in state funds earmarked for the hotel building. “He surrendered to the Colombo Fort magistrate’s court and was remanded till Wednesday when another hearing will take place,” a court official said. In September another close aide of Rajapakse was jailed for three years for redirecting $4 million of government money toward Rajapakse’s unsuccessful 2015 re-election bid. Current President Maithripala Sirisena has vowed to investigate allegations that Rajapakse’s family and friends siphoned billions from Sri Lanka’s coffers during his nearly 10-year rule. Two of Rajapakse’s three sons, including legislator Namal, have been charged with money-laundering. Those cases are still pending. Finance Minister Mangala Samaraweera recently announced the freezing of $33 million in bank deposits belonging to members of the former regime, pending money-laundering investigations.